Vipera seoanei is a venomous viper species. There are two subspecies recognized, V.s.seonaei (pictured) and V.s. cantabrica. This is a highly polymorphic species. 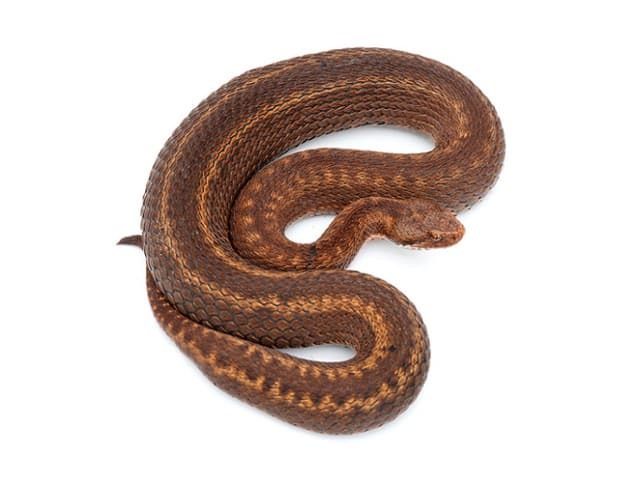 They show up three morphological types, a uniform brownish morph with no pattern, roughly twin-striped pattern with the ground color expressed as two narrow, straight dorsolateral longitudinal lines along the body and a well-developed, brown zigzig pattern down the back set against a beige or light-gray ground color. Because of the fact that the Vipera seoanei are very active snakes equal that they are not very big, they need an enclosure with enough space. They grow up to 0.5-0.6 meters (1.6-2 feet), so the size oft he cage should be at the minimum (wide, depth, height) 0.6 x 0.6 x 0.5 meters (2 x 2 x 1.6 feet) for a single animal. But bigger is better. The height is not very important, but if you will build some hiking possibilities, they will use it. They love to have a well built cage, with a lot of hiding spots, as they live in their natural habitat. As I wrote in the housing section, they need a lot of hiding spots, to feel good and safe. I prefer using natural hiding spots, like stones, leaves and tree limbs. Best substrate to keep them is a mixture from soil, which keeps humidity for some time. Depending on the height of your enclosure, the choice for the lamp with the power from 25-60 W is required. The place where they take their sunbath should raise up to 35 °C (95 °F). The ambient temperature of the enclosure should range between 20-25 °C (60-77 °F). I provide lighting cycles (day/night) depending on the time of the year, spring/autumn around 8-10 hours and in summer up to 14 hours. Like every reptile (except some desert species), they need fresh water all the times. So you have to replace fresh water two or three times per week. A common way to drink is also after the misting, but nearly all will also take water out of a drinking vessel. Because of their distribution in a very rainy area in southern Europe, they need some temporary “rainy days” in captive conditions. So you have to spray water one or two times per week into the cage to stimulate rain so the humidity can reach 80%-90% but after the misting the enclosure should have the chance to dry again. To raise the newborn Vipera seoanei you can use, without problem, frozen baby mice. If you move them in front of the snake, they will bite into the mouse and after a few minutes they will eat it. Because they grow fast you should offer every 7 days a meal. The food for the adult snakes are also mice in the right size every 2-3 weeks. These snakes don’t have any issues with their feeding. Like every venomous snake, you have to be careful. Because of the small size of Vipera seoanei, you can handle them without any problems with one hook. Cleaning every time some excrements are sighted in the enclosure. During the cleaning procedure I place the snake into a separate secure box to work safely. If you manage the rainy days and the humidity right, you wont´t have trouble with some bad sheds. Depending on the age, they will shed 2-4 times per year. You have to hibernate the snakes during winter. If not, they can stop feeding, because of the loss of their natural internal time. As a result of this also they will not mate in spring. You also have to watch for the rain showers, some will not drink out of a drinking vessel and only use water drops after a rain shower. So in the worst case, they can get dehydrated.